​Smoked prime rib is one of the greatest dishes you can eat. Perfect for holidays, like Christmas, parties, or just any occasion, few other foods can match up to these beef rib's succulent, juicy flavors. But that's only the tip of the iceberg when it comes to rib roasts, as there's plenty more you can do with them besides just roasting them in an oven. To really enhance your rib roast's flavor, there's many things you can do to it, chief among them being smoking. Combining the natural juiciness and flavor of a prime rib with some subtly sweet smokiness just can't be beat. And it's such an American dish, you just have to try it. How do you do it? What are you going to need to try? Let's figure that out as we go over a recipe for a delicious smoked standing rib roast. In order to cook your smoked standing prime rib roast, you'll need to gather a few ingredients and materials first. Luckily, this prime rib roast recipe is fairly simple and light on ingredients, meaning it's a snap to cook even for novices who haven't tried any other beef recipes before. Wood chips or chunks (details below). Freshly ground black pepper, coarse grind. Kosher salt or sea salt.. Standing rib roast, ~5 lbs and tied with butcher's twine. The wood you choose for smoking is as integral to the meat you want to smoke. Heart beef ribs like these can handle more robust types of smoke, though to fully appreciate the natural flavors of the meat, it's best not to try and overpower it with the smoke flavor​. Heavy smoke from woods like hickory wood can work, though a slightly lighter choice like mesquite is likely the best option. Combining that with a fruit wood like apple or apricot can also be a good choice, too. Once you've collected all the necessary materials, you can finally begin cooking your standing rib roast. To begin the process of cooking your roast, first you'll need to trim off any extra bits of loose fat hanging on the outside, leaving any fat that's attached to the meat. Next, for the steak seasoning, combine a fourth of a cup of olive oil with the same amount of black pepper, plus two finely minced cloves of garlic and a tablespoon of kosher salt, rubbing the oil into the meat on all sides. Let it stand at room temperature for at least half an hour after that, as an evenly warmed piece of meat cooks more evenly and retains more moisture than one you've tossed onto the smoker ice cold. As your roast warms, the best use of your time is to start warming up the smoker you'll be using to cook it. Load up the charcoal with a three hour smoke in mind, lighting and closing the lid until a temperature of around 225 degrees Fahrenheit is reached. If you're using wood chips instead of wood chunks to get that awesome smoke flavor, start soaking them in hot water at this point, too. You can read more info on how to work the charcoal grill here! After both the smoker and your meat have come up to temperature, you can finally start cooking. Fill the water tank, toss in the wood, and lay the rib roast directly onto the grates fat side up. Make sure to place a smoker-safe baking pan underneath your meat to catch the drippings, as they have plenty of delicious uses after you're done. Add in a few splashes of cold water to the pan as you cook if it needs it, though the naturally humid environment within the smoker might take care of it. ​While smoking meat, monitor the amount of wood chips, water, and charcoal you have left, adding more of each as necessary. Depending on the size of your prime rib roast, the process will likely take between two and three hours as long as the temperature remains consistent. The roast will be done once a meat thermometer stuck into the thickest part of the meat registers the internal temperature 125 degrees F​. Once you've removed the meat from the heat, place it onto a cutting board or platter and tent it loosely with aluminum foil. Allow it to rest like this for at least half an hour if not a full hour. It is worth the wait. During this time, the meat fibers will relax and reabsorb some of their lost juices, making for a more tender and flavorful cut of roast. The cooking process will finish at this time, too, as the residual heat within the smoked prime rib roast roast passes through the meat and raises the temperature another 5 degrees or so. You can also use this time to, if you wish, turn the collected drippings into a sauce or gravy to serve with your meat. After resting is complete, you're finally able to eat what you've worked so hard on. 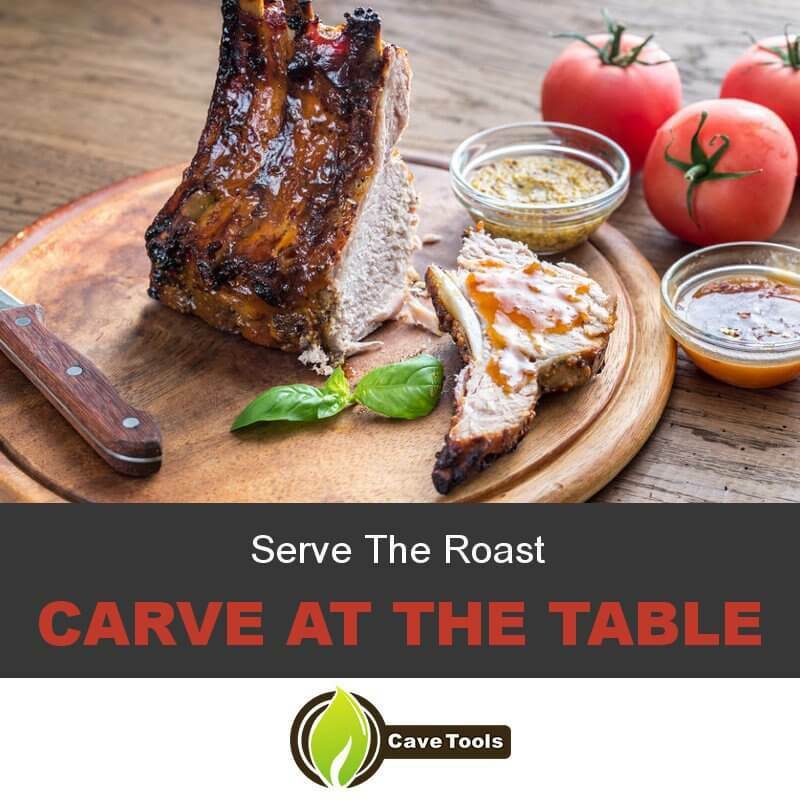 Standing rib roasts are fun to carve at the table, especially since they're pre-portioned due to the way they're made. Just cut between the bones to give everyone a perfectly sized serving. 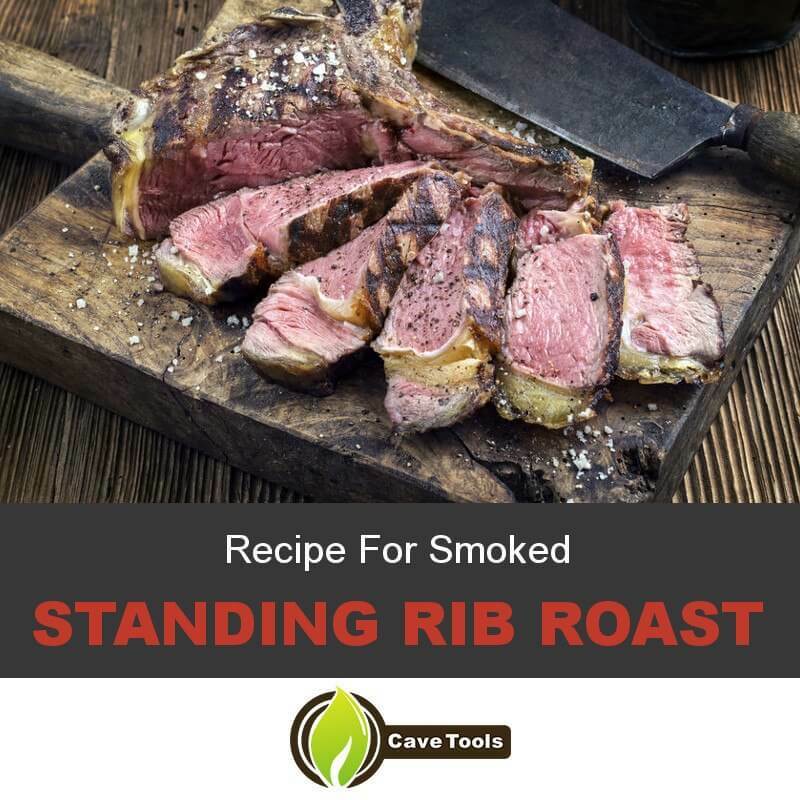 Serve it up with sides like fresh steamed or roasted ﻿﻿vegetables and potatoes with a bit of olive oil,, or whatever your favorites might be to eat with a prime rib roast and accentuate the amazing smoke flavors.. Add a glass of red wine. Your meal is sure to taste great no matter what it includes, though, as it's headed by a delicious rib roast you made yourself. ​Perfect as the main course for Christmas dinner or any other occasion to treat family and friends. With this simple and easy to follow smoked prime rib roast recipe, you too can make a delicious smoked standing rib roast. The short ingredients list and small amount of steps means it's easy to cook no matter if it's your first or fiftieth time trying out this meal (and you'll definitely be back again in no time given how good it tastes). What did you think of this prime rib recipe​? Any tips on smoking meat or cooking a rib roast you might want to share? Do you have any other favorite beef recipes? Pork recipes? Leave a comment down below with your favorite ideas to wish Merry Christmas over a nice dinner, and don't forget to share this page (and some leftovers) with a friend. How Long Do You Cook a Standing Rib Roast? As an estimate, you should cook a standing rib roast for 15 minutes per pound. When you are smoking meat at low and slow temperatures - such as 250 degrees F - it can take 4 to 6 hours to finish cooking. What Cut of Meat is a Standing Rib Roast? The standing rib roast is also known as the prime rib, one of the nine primal cuts of beef. It is often cut from ribs six through twelve in the beef. You can often purchase as little as two ribs and as many as seven ribs. What Makes Standing Rib Roast Taste so Good? The smoked prime rib has a juicy, tender “eye” of meat in its center. This “eye” is surrounded with fat, making it especially flavorful and beefy tasting. These muscles are not often used by the beef, so they are more tender than other cuts of beef. What Temperature Do You Smoke Standing Rib Roast? 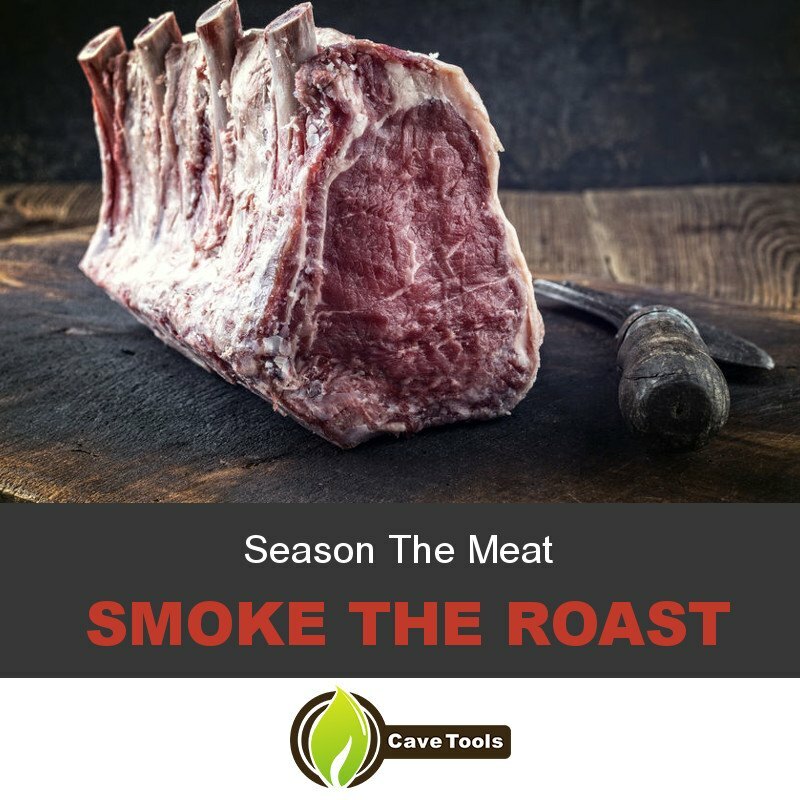 You can smoke standing rib roast at 225 to 250 degrees F. You should cook it until the internal temperature (as measured by an instant read meat thermometer) reaches 125 degrees F.
What Is The Best Wood for Smoking Standing Rib Roast? Hearty beef flavors can stand up to more robust wood choices like hickory wood or mesquite, but it is better to smoke a standing rib roast with a more mild wood. Apple or apricot woods will allow the delicate flavors of the standing rib roast to shine through.